Spring 2016 inventory is moving quickly! Don't wait. Order your plants now! Based on early requests and a few large orders availability may be limited soon. 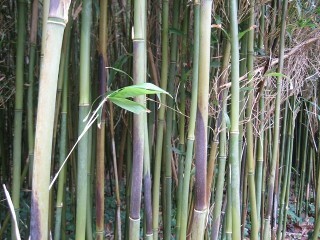 Bamboo continues to generate new growth year after year. 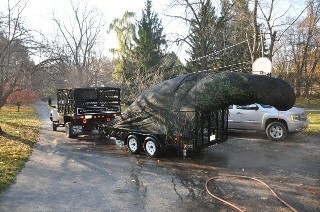 If a tree limbs falls on your 10' tall evergreen, you're going to need a new tree. If a tree falls on your bamboo, it will naturally heal itself with new growth. Bamboo is very effective as a fast growing wind break. It also works well to diffuse road noise and trap blowing dust. Bamboo absorbs 5x the CO2 of an equivalent stand of trees. It also promotes 35% more oxygen into the air we breathe. The flexible nature of bamboo allows it to move with the wind, enabling it to withstand extreme winds. Bamboo has a root system like a net. As the roots and rhizomes intermingle, they create a protective web that holds the soil in place. 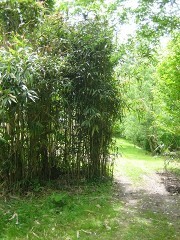 Bamboo can be planted along slopes or streams to prevent the soil from eroding. 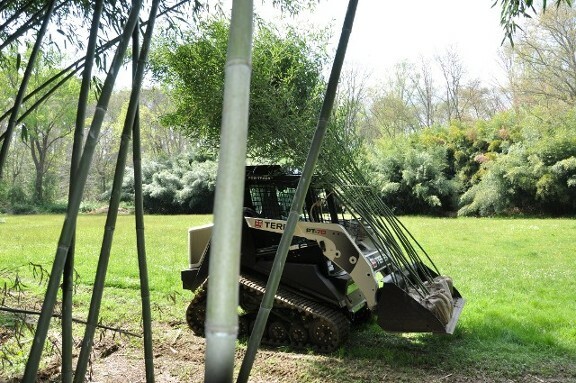 In addition to holding the soil together, bamboo provides an excellent habitat for small animals and birds. 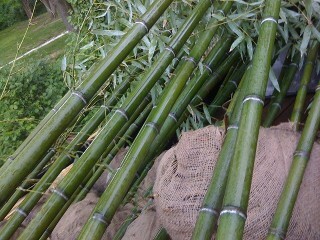 CC Bamboo provides the highest quality bamboo plants available.Our plants are locally grown and harvested. All plants are sold B&B unless otherwise noted. Since our plants are field dug, they contain mature rhizome systems and will size up much faster than small mail order plants. In fact, you can expect your plants to produce 1st year growth that is a size smaller than what was purchased. 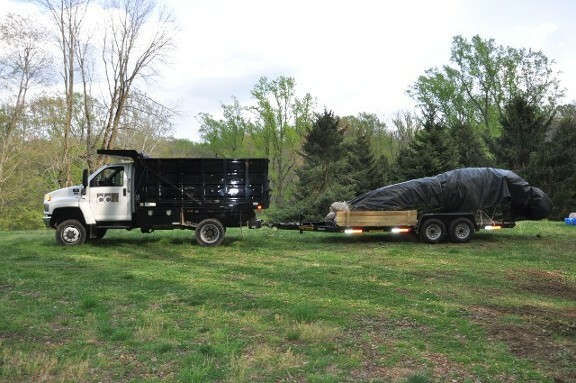 "A 10'-15' tall plant can be expected to produce 7'-10' tall growth the year it is planted." 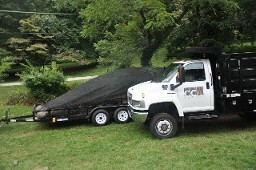 We welcome custom orders and requests for plants to that specific requirements. We also provide contract growing for large projects. Mid size running bamboo. One of two species native to the U.S.
Short branches with small leaves a very erect habit. Makes a great natural looking privacy screen or wind break. Phyllostachys aureosulcata "You can't go wrong with this time tested species"
One of the most common bamboos seen along the East Coast. Also one of the hardiest and most proven. The culms are green with yellow grooves. Also known for its zig-zagging canes that can change direction as they grow. 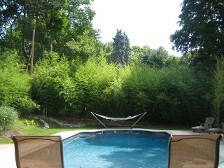 A fantastic privacy screen that in a short period of time will produce good size canes. Grows well in sun or shade. Although listed at a maximum height of 45ft. 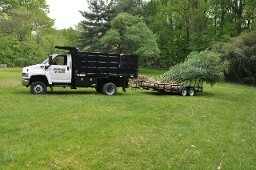 I have measured this species in Paoli, PA at 54ft tall! 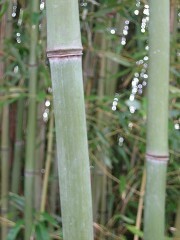 Phyllostcahys bissetii "Cold Hardy, Dependable & Grows Dense in Narrow Areas"
Mid size running bamboo and a vigorous grower. This bamboo provides a dense screen in a short period of time. Green culms and a dense habit. 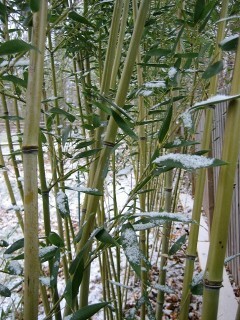 This bamboo has proven to be extremely hardy even when subject to constant winter winds. A very hardy species, capable of growing just about anywhere. Very wind and cold tolerant. Silvery blue color to new culms that fades over time. Phyllostcahys nigra "Limited Availability, Recommended for Protected Areas"
Black bamboo is the most striking of all the Phyllostachys species. Although beautiful, this species needs protection from winter winds. New culms are green and turn black over a period of time. The leaves are smaller and more sensitive than most species. Phyllostachys nuda "Extremely Cold Hardy"
Possibly the most hardy of all Phyllostachys species. Dark green culms. New culms have a powdery white band around the nodes. Not as prevalent as yellow groove, but fairly common throughout the North East. One of the favorites for shoot flavor. 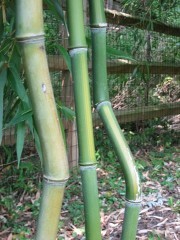 Known as Arrow Bamboo, this species has been widely cultivated throughout the U.S. A durable species that can handle salty shore conditions as well as shady wooded areas. This species tends to shoot a little later than most others and continues to produce new growth into the fall. Great for virtually any area with a little protection from the sun. The minimum temperature range on this species is questionable. Many books list it as hardy to -10(f). Based on my working experience with this species and factual data from the winter of 2013, I would list the hardiness at zero. Mid size bamboo with a large tropical leaf. Does well in shady areas and as a understory planting. 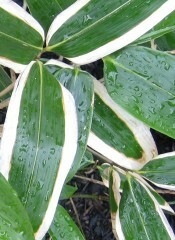 This is a great bamboo, with large leathery leaves. 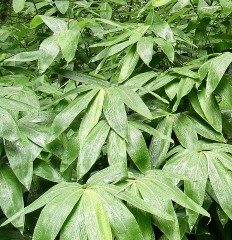 The leaves can grow up to 12 inches long and 4 inches wide. Despite it's tropical appearance, it is know to cover enormous areas in the mountainous regions of Japan. A slightly smaller bamboo that can be easily controlled. 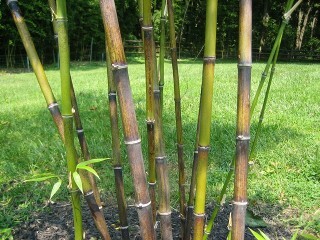 Veitchii is a specimen quality bamboo that is difficult to propagate and usually limited in availability. New leaves emerge green and develop a white varigated edge in the fall. The white and green color combination will surely liven up any area. Does fine in the sun, but prefers shade.